Load on your smart phone with Kindle app or view on Kindle device or computer. Be anywhere and have the info you need. Buying through the link above benefits Oldgas.com with a small referral commission from Amazon. whoops... didnt know that oldgas could get a kickback. glad i said something today though! AND a SMART PRINTED BOOK in truck. Just a matter of time before these SMART Gizmo's start CRASHING like Computers or picking up Viruses! thanks for the kindle version of your book ,it came in really handy today. Too bad Jim won't get a commission on this, but, the book is also available for the Nook. One reminder for anyone buying this version. Sometimes a pump will appear with information above the pump. This information is for the previous pump. 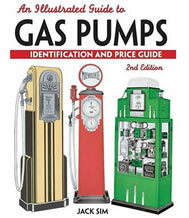 Once you find the picture of the pump you are interested in, the information will be below the picture. A little confusing because you can only look at one picture at a time. I still get people contacting me about a copy of the book and I explain how to come here and buy this version. Also available on iPad ! I have the second edition on my iPad and iPhone both run great. Thanks John for the response.Sounds like the best route for me. Are you using the kindle version on your iPad? Do you run the kindle app then or ?? Just got my copy of the Pocket guide! Let me say thanks for offering [url=http://www.amazon.com/gp/product/B00505FF5U?ie=UTF8&tag=primarilypetroli&linkCode=as2&camp=1789&creative=9325&creativeASIN=B00505FF5U]Illustrated Guide to Gas Pumps[/url] in a Kindle format through Amazon. I purchased this book in Kindle format today and I find the pump illustrations look great on my IPAD (i like being able to zoom in and out with a flick of my fingers) and searching and moving about on the IPAD is very fast for an ebook with this many pages. Also with the Kindle format I was able to use a Kindle to PDF converter to create a PDF copy of the guide, which I can use both on my IPAD and my Microsoft Surface Pro3 in native PDF format.